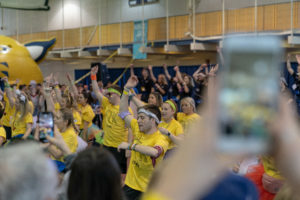 Quinnipiac University’s annual ten-hour dance marathon, QTHON, again proved that miracles can happen when it surpassed its goal of $323,000 by raising a total of $332,567.12 for Connecticut Children’s Medical Center (CCMC). This year’s QTHON took place on Saturday, March 23, after the QTHON management team and its many committees spent months preparing for the event. However, QTHON could not have been possible without the dancers who signed up in teams or individually to raise money for the kids. After signing up, each dancer chose a personal fundraising goal that they pledged to achieve by the end of the event. 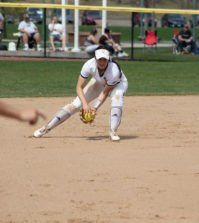 Organizations such as the Quinnipiac Student Nursing Association, Alpha Phi Omega and many Greek-affiliated organizations worked all school year to fundraise in order to be able to sponsor a “Miracle Child” for the event. These children, who came to QTHON, were previously patients at CCMC and have benefited from the money that has been raised from past dance marathons. QTHON 2019 began at 2 p.m. on March 23 when all the dancers and members of the QTHON committees and management team took to their feet, pledging to not sit for the full ten hours until the clock struck 12:01 a.m. However, there were events held throughout the night to keep the night fun and uplifting including a talent show put on by the Miracle Children, performances by Quinnipiac student organizations, such as Dance Fusion and Dance Company, and the hourly MORALE dance. The MORALE dance is put on by QTHON’s MORALE committee, which is responsible to keep the spirits high through encouraging the dancers to keep on dancing throughout the night. Every hour on the hour, the MORALE committee performed a ten-minute dance and encouraged the dancers to dance with them. The MORALE committee taught the dancers its dance so they would be able to follow along with them. On top of hyping all of the dancers up, members of MORALE were constantly fundraising throughout the night and the weeks leading up to the event, which got them to be the second top fundraising team by raising $23,002.60. 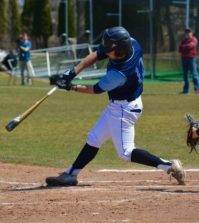 “We [MORALE committee] were striving to fundraise as much as we possibly could the whole week before and were constantly sending our donor drive around to family and friends,” Link said. What really sets QTHON apart from other events was the passion that every person who helped play a part of the day had for the kids whether they were a part of management, MORALE or were a dancer. However, the whole day could not have been possible without each member of management and the committees showing their utmost dedication to what their role was and giving it their all since being offered their positions. 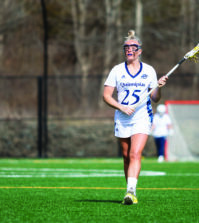 For the executive directors, specifically, work to prepare for QTHON was done both on and off Quinnipiac’s campus. For some, joining committees, such as the high-energy MORALE committee, was decided from being at past QTHONs and seeing the passion and dedication these members had for CCMC. For others, like Bosta, the decision to step up and hold a leadership role was due to how QTHON has touched their life through personal experiences. 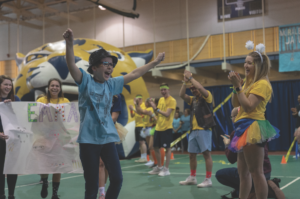 The moment of QTHON that everyone waits for is the reveal of how much money Quinnipiac raised for CCMC and this year, that was a very special moment for everyone involved.